Blogging has taught me to love short stories. I can read one or two on any given weeknight, and finish an entire story while also whittling away at a book (that I can later review, yay!). Short stories are often dark and dangerous... which is perfect, because I still prefer small bites of horror, rather than novel-length ones. And if we're going to talk about great, fantastical short stories, Kelly Link must enter the mix. She is a master at both editing and writing tales of this size, and that's all there is to it. 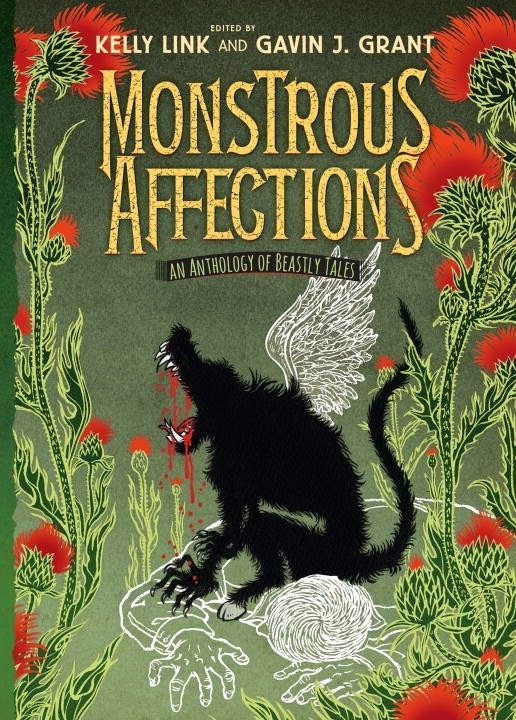 That's why I'm so excited for Monstrous Affections: An Anthology of Beastly Tales, edited by Kelly Link and Gavin J. Grant (EXCITED!). It will be released by Candlewick on September 9, 2014. Yay! This sounds like some interesting stories! Thanks for sharing! Oh man, this sounds so good!